Actually trying to steal money this way is not as easy as you think. > Can this even be called hacking? Yes, it can. Password guessing is a well-known hacking technique. If there was no password, or if the password was exposed (like on a password prompt which says "the password is hunter2", or visible with "view source" on the page), or if simple and obvious URL manipulation were enough to get in, THEN you could rightfully ask whether it could be considered hacking. "if the password was exposed"
The password was the same as the login name with "1" tagged at the end, and the way the article is written suggests it's the standard default password for the system they were using. It was exposed. > and the way the article is written suggests it's the standard default password for the system they were using. It was exposed. If you are right, I apologize. One can rightfully ask whether it could be considered hacking. Especially coming from some unknown AC, such a reliable authority. > "Can this even be called hacking? For me, this is like finding a keyring with a bunch of keys and trying them all on a door. Eventually one would work and the door would open." This is the definition of a dictionary attack. Depends on if they even used a dictionary attack. If all they did was port scan systems until they found a hit, then checked what app it was running, then tried the default password, then they did not do a dictionary attack. This would not be "hacking" in the typical sense of the word, it would just be "probing", then using publicly known information. Kind of like walking past a bunch of cars and trying the door in each one to see if it's locked. You wouldn't say someone "broke into" the car, but "entered" the car. I have no idea whether these guys used a dictionary attack; I was just pointing out that the commenter's description: "Can this even be called hacking? For me, this is like finding a keyring with a bunch of keys and trying them all on a door. Eventually one would work and the door would open." is the definition of a dictionary attack, commonly used for password cracking. To be pedantic, the term "hacking" is not specific to the act of gaining unauthorized access to systems, though it commonly carries that connotation. The keyring with a bunch of keys is the dictionary. The door on which the keys are tried is the password hash. When a "key" from the "keyring" is found to work with the door, i.e., hasing a word from the dictionary creates the same hash that the cracker is trying to crack, "the door would open". Maybe a more appropriate term would simply be "password guessing". Technically, if you open an unlocked car (or house) door without authorization, you've "broken into" it. Entering is a separate crime. If you leave your house unlocked (but the door closed) and someone comes in, they've committed the crime of breaking & entering. If you left your door open so that they don't need to open it, then no "breaking" has occurred. The crime is "trespassing". I don't really think it's considered hacking. More like "cracking" as in trying to crack the password maybe? According to CFAA you face penalties akin to life imprisonment for such sophisticated hacking. Notice the sarcastic use of sophisticated. "Can this even be called hacking?" I think it should be called 'hacking' in the legal sense in that whoever does it should still be liable for any damages caused. In the "techie" sense ... probably not. It's black-hat hacking, but it's not cracking. It's the sort of hacking that the pre-teen set routinely engages in, and is so trivially easy to stop that it's hard for me to be more upset about the kiddies than about the fact that the school district is so incompetent that they shouldn't be running servers at all. This is what happens when you treat your IT staff like digital janitors and cut then in the first round of layoffs. Cut them, then outsource to a third party. And of course, the outsourced party only kinda gives a crap cause, hey, worst comes to worst, they say, "oops" and fix it. Like now. Whereas the in-house guy knows if he doesn't do it right, he's fired. No, it's the same bad as 12345678. Maybe worse, because all manufacturer default login credentials can be easily found with a quick web search. The Navy SEAL rant has many well-known derivatives; 4chan's users frequently make spinoffs to these copypastas that evolve over time. 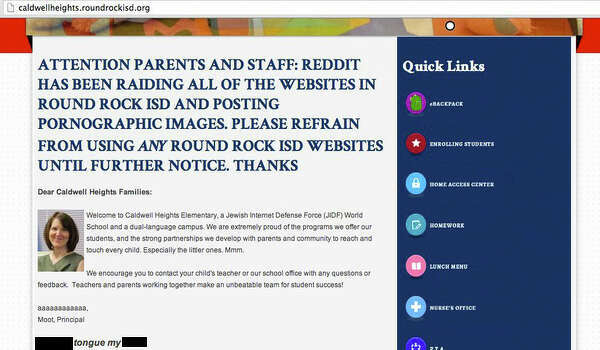 The biggest smoking gun towards 4chan here (other than casting the blame on 9gag and Reddit, two sites that aren't held in high regard by the 4chan userbase) is the reference to the Jewish Internet Defense Force. I don't think I've seen that mentioned anywhere online other than the 4chan /pol/ board. It makes me think of the scene in "War Games" where David Lightman is sent to the office and obtains the new password. My advice: Change admin username to "stupid" and password to "stupider". At least it will be harder to crack. I can tell you it was 4chan. They love poking fun at reddit and dislike 9gag. And another common meme is to imply that moot likes kids. Cheese pizza. Is it time? I think its not a bad idea! I am agree with you!